40K on a bank holiday. What more could any 40K fan wish for? 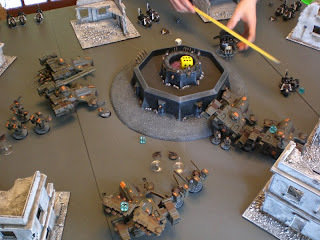 We haven't played Warhammer 40K for a little while, so with no 40K tournaments on the immediate horizon we thought we'd make a day of it. The greatest thing about 40K as a hobby is how social it is. On the bank holiday monday 4 of us rocked up for a day of beer, pizza and warhammer 40K in its entirety, whether we were working on our 40K army lists, miniature painting or just exchanging cool ideas. Or in the case of my friends, claiming that the Tau Codex is overpowered and that they should receive a cover save against markerlights. Hey, it's not my fault if I can out play them with tactics! It's a shame I'm across the water from Fritz at The Way of Saim Hann, because he's someone I'd love to play. So having just set up the terrain, made everyone a cuppa tea and being the host I was expected to play first as well. We agreed on 1500 points, because that's what we usually play. So I took out my current Tau warhammer army while James had the choice of Thousand Sons, Eldar, Ravenwing, Deathwing or Dark Angels. 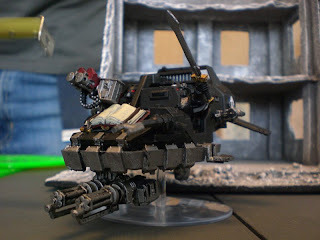 Someone might say he was spoiled for choice, but that didn't stop him from choosing Ravenwing -again! James won the roll, choosing the table half nearest him, putting down the first counter and taking the first turn. Brilliant! I needed him to take the first turn should he Outflank everything. It meant that his units would arrive before mine did. Then I could counter whatever he brought on. During the counter placing phase he placed all 3 of his 12" from his table edge in the centre, each one 12" apart perfectly. Meanwhile, I placed a counter 12" on in the centre with another 24" on, just around to the right of the Chaos Temple in the middle. It was a gamble, but I'd have to sweep my mobile firing line around in that direction to claim/contest at least 2 objectives. It was unfortunate that 3 were in his deployment zone, but there was nothing I could do about that. "Everything's in Reserve!" I replied before we proceeded straight on to TURN 2. This was a very quick game, so I haven't remembered exactly what happened. I didn't have time to take turn by turn photos either. Basically, James brought a unit on. It had little or nothing to shoot at. I brought a unit on, it killed one of James's units and so on until the Tau occupied 3 objectives while James held 1 and nearly lost his squad on Turn 7. I kept my entire army in the middle portion of the board, more than 24" from the edges, carefully moved my models around the maximise my firepower and where firepower failed, I blocked his path (and line of sight) with parked tanks. Because I denied him targets early on I sustained few casualties, losing only a Tau Battlesuit team with flamers (which he was scared to get close to) and a Tau Devilfish along with 4 of 6 Tau Firewarriors. Meanwhile he lost everything but for 6 bikes and a landspeeder Tornado. There was a mighty cheer from everyone (except James) when the Grand Master of the Ravenwing's Landspeeder took a direct hit from the Tau Hammerhead and exploded spectacularly. As a group of guys who are tired of Sammael hosing down troops or getting a rending hit every round from his twin linked assault cannon, it was a very satisfying sight. Nice report. 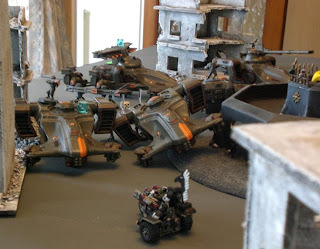 Ravenwing armies are really great fodder for the fury of the Tau Empire. He he he. very nice game against the Ravenwing army I basically use the same tactics but the fact that tau have such incredible shooting and at S5 still very dangerous to the elite army like ravenwing. Curious to see how you handle the IG they seem to give everybody a head ache at the moment. Sounds like a good time! We do a "call in sick and play 40k all day" day about once of year with our group, there's something nice about sipping some coffee at eight in the morning on a weekday and looking at all the games about to be had. Nice battle report. I miss the days when my club would met every weekend for tons of gaming fun. Now I play at my FLGS and there is less comradeship there. Nice cliffhanger too. Well I've got Stealthsuits to prime! How to model that Markerlight the team leader carries......Gotta come up w/something ultra keeeewl. Dude, you rock-keep up the good work. I look foward to every one! Thanx! Ummm, I post as SinSynn on BoLS, not sure how to do it here, so 'Anonymous' it is, I guess!